I picked two huge heads of broccoli this morning and wanted to use some up the same day it was picked. As a major heat wave is coming, I think some lighter fare is in order. I’ve done shrimp many times but let’s try some fish. 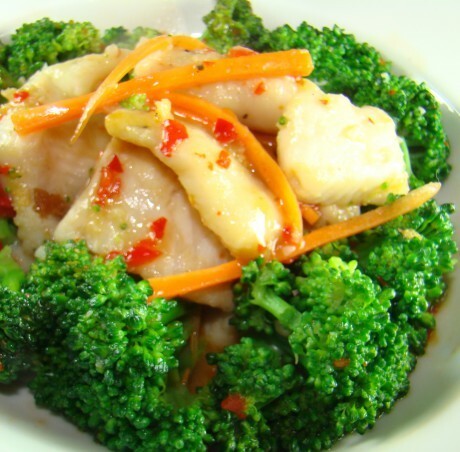 For this simple recipe I used Swai fillets but I’m sure any firm white fleshed fish would do. Be sure to blanch the broccoli first, and cool in an ice bath – this will ensure a nice bright green color and tender texture. 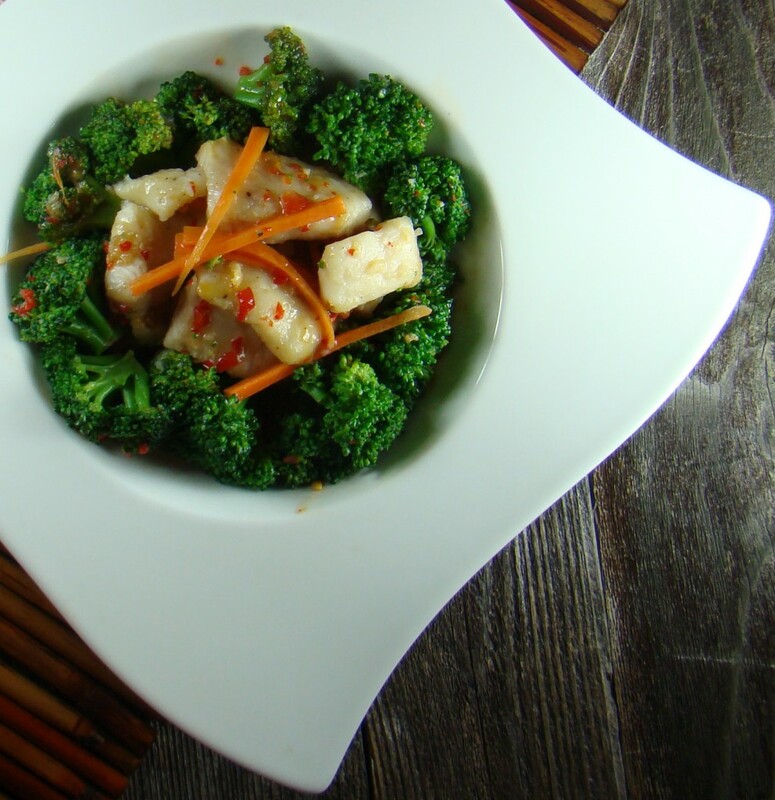 Succulent fish, colorful and healthy broccoli and carrot, a little bit of heat from some chilli paste combine for a perfect quick midweek meal. Put a small pot of water on to boil. While water comes to boil, combine marinade and fish, set aside. Blanch broccoli in boiling water for 2-3 minutes. Remove broccoli from boiling water with a slotted spoon or mesh strainer and immediately plunge in ice water to stop cooking and keep its fresh green color. When cool remove from ice back and drain well. Add fish in a single layer. Cook over medium heat for about 2 minutes each side, until both sides turn white. Don’t overcook the fish! Remove from wok, and set aside. Cover it loosely. Add remaining frying oil to the wok. Saute the garlic, add broccoli and carrot. Increase heat to high. Add wine to the vegetables, and quickly stir. Add a pinch of salt to taste. Add chicken stock and cook until liquid reduced by half. Add the fish back to wok and gently toss to combine, avoid breaking the fish apart. Add sauce and cook to desired thickness. Serve hot with hot rice if you like. This was delicious! I’m definately putting this into rotation! I think it’ll be great with chicken! This sounds real good, David, and that presentation is beautiful. You managed to cook that fish without it being destroyed in the process. That’s not easy to do. And yes, we’re in for some hot weather! Stay cool, my friend. Adding the fish in a single layer and flipping each piece, then carefully removing it was the key John. This definitely looks good. Not sure I will try it since it isn’t….pork, lol, but if I ever get room in the freezer for fish, maybe I will. Certainly no reason you can’t make it with pork Becky! Just omit the fish sauce in the sauce part. Everything looks quite delicious here. I think I will stay a while… and come back for more, too! Glad to have you! I need to pop over and see your place!